With 15 amps of power, 4,600 RPM, and over 50 degrees of cutting range in a package under 30 pounds the Makita 10-Inch Compound Miter Saw is one of the best choices in its price point. The Makita 10-Inch Compound Miter Saw (Model : LS1040) features a primarily aluminum frame which is the basis for its light weight and portability. The aluminum frame also protects the saw from weather related damage steel and other heavy metals often suffer from. 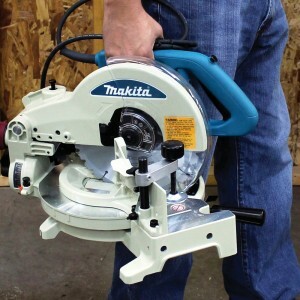 The direct-drive feature of the Makita 10-Inch Compound Miter Saw’s motor means users will not suffer the delay and poor control inherent in belt driven electric saws. The motor exceeds many other saws in its price range by producing 15 amps of power at 4,600 RPM, more than enough strength and speed to tackle any wood on the market. A dual post compound pivot arm provides flexibility in cuts with miter cutting points set at 0, 15, 22.5, 30, 45, and 90 degrees Bevel cuts on the Makita 10-Inch Compound Miter Saw go up to 45 degrees and the miter adjustment range goes to 45 degrees left and 52 degrees on the right. The flexibility and strength of the Makita 10-Inch Compound Miter Saw make it appropriate for professionals, homeowners, exterior job sites, and any workshop. Social media and e-commerce ratings consistently show the Makita 10-Inch Compound Miter Saw has a user rating of above 90% . Many reviewers have noted the the Makita 10-Inch Compound Miter Saw has less vibration than comparable models and reliability marks are very high for its price range. The Makita 10-Inch Compound Miter Saw ships with a wrench, triangular rule, vertical vise, carbide tipped blade, and 1 year manufacturer warranty. Due to its strength, portability, flexibility and value, we strongly recommend the Makita 10-Inch Compound Miter Saw as the best value for a compund miter saw in its price range.